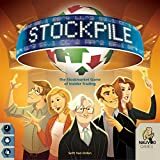 Raise the Bid - Most players tend not to be aggressive enough during bidding in their first few games of Stockpile. Stockpiles that contain more cards in them can often be worth surprisingly more than other stockpiles with fewer cards. While it is possible to pay too much or be caught by trading fees, the typical new player settles on a 'safe' stockpile too early. Aim for Majority Bonuses - Don't underestimate the $10K bonus given at the end of the game for the majority shareholder of each company's stock. If you gain an early lead in one stock, don't relinquish it so lightly. Conversely, be mindful of any company that goes bankrupt in the last rounds of the game. If you can find one share at the end of the game, then you can sneakily capture an easy late majority. Money Advantage - Money advantage is critical to your decision of how to place your cards. If you have less cash on hand than other players, try to make the stockpiles as even as possible, so you can't really be bullied into a pile of junk. If you are the cash leader, then consider stacking one pile with great cards to convert your liquid assets into extremely profitable stock. But, be careful if you aren't the only player with $25K because someone earlier in turn order can buy out that stockpile before you get a chance! Movement Predictability - Every company card will be uniquely affected by a forecast card each round. With knowledge of your private and public information, you can deduce the probability for any other given stock to go up or down. Example: My private information is Cosmic Computers (-3), and the public information is Bottomline Bank (-2). In this case, I would know that all other stock prices will be positively impacted by forecasts this round.